You'll be £4.99 closer to your next £10.00 credit when you purchase Abandon Ship!. What's this? Captain Tony McCrum's naval career started in 1932. He survived the sinking of HMS Skipjack at Dunkirk and went on to serve on minesweepers and at sea during the landings at Salerno. His wartime experiences were recently published as Sunk by Stukas. This book covers the second part of his naval career between 1945 and 1963. Having arrived back in Plymouth from Trincomlee as a lieutenant aboard the destroyer Tarter in November 1945, his first appointment was as senior instructor at the RN Signals School in Devonport. There then followed two appointments as Flag Lieutenant; first to Admiral Pridham-Wippell, CinC Plymouth Command and then Admiral Sir Rhoderick McGrigor, CinC Home Fleet, where he was also Deputy Fleet Communications Officer. He was based on the admiral's flagship, the battleship HMS Duke of York which he joined in 1947. The fleet exercised in the Atlantic and Mediterranean and 'showed the flag' in various ports in the USA, Caribbean Islands and the Baltic. In May 1948 he was promoted Lt. Commander. In 1950 he instructed at the main Naval Signals School at Leyedene House near Petersfield. Promoted Commander, now 32 years of age, he was surprised to be appointed to accompany King George VI on a state visit to Australia and New Zealand. This was to be aboard the liner SS Gothic as there was no Royal Yacht at that time. However after months of preparation the voyage was cancelled because of the King's terminal illness and the coronation of Britain's new Queen. As a social history that ties together the aspects of post-war decline and the challenge of leadership, this is a thorough and enjoyable insight into the softer issues of naval operations in the mid-twentieth century. 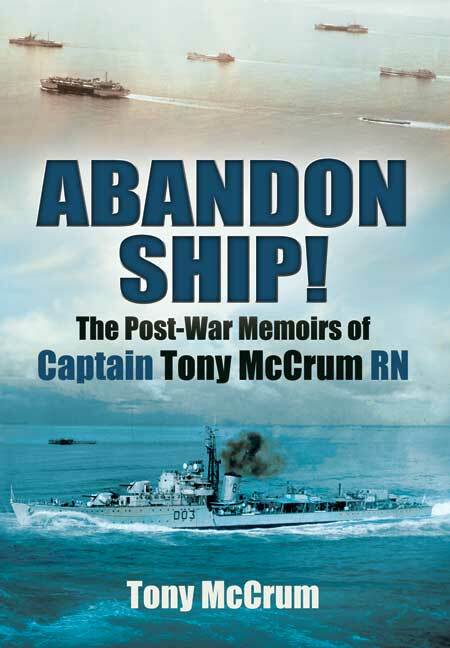 Those who enjoyed Captain McCrum’s first volume of memoirs (reviewed in the November 2011 NR) will enjoy this one too: I certainly did. It takes us from his return from wartime adventures to his final sea command in the Amphibious Warfare Squadron in 1961-2 and his retirement in 1964. He has a rollicking style, wears his heart on his sleeve and comes across as a man who you could safely be cast adrift on a raft with. You would not be bored but might be engaged in a few arguments with his sometimes unconventional views which are well worth reading, even if you disagree with them: his thoughts on command are recommended reading. It still scores alpha-plus-query: strongly recommended bedtime reading, not least for some of its hidden lessons for the future, if any will heed them. After the war, Tony McCrum continued in his specialisation concerning signals and communications during assault landings. He served on the Staffs of the Commanding Officer Plymouth and also the Home Fleet. In January 1955 he took command of the destroyer HMS Concord in the Far East. Between 1960 and 62 he commended the Amphibious Warfare Squadron in the Persian Gulf to prevent Iraq invading Kuwait. Now 90 years of age he lives in Devon.